Ezgjan Alioski celebrates scoring Leeds United's second goal at Derby. Picture: Tony Johnson. Injury-time goals in both halves left Paul Heckingbottom still looking for his first win as Leeds United boss as his side drew 2-2 with Derby County at Pride Park. United led twice through goals by Pierre-Michel Lasogga and Ezgjan Alioski, but were made to pay for defensive errors at the end of both the first and second half. A win would have flattered the Whites as they were under pressure at times and rode their luck a little, but they will also feel disappointed not to see out the game in the closing stages. 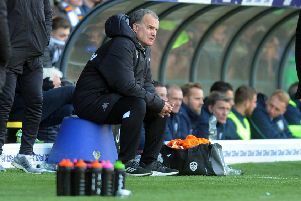 Head coach Heckingbottom made four changes to his Leeds side from the weekend and changed the formation for the third successive game as he aimed to find a winning formula. Liam Cooper and Gaetano Berardi both came back into the defence after suspension, Ronaldo Vieira was restored to the midfield and Kemar Roofe was given the number 10 role. But there was no instant return after his six-match ban for Samuel Saiz. What Heckingbottom got was a committed defensive display in the first half, but Leeds lacked any real threat and it was a shock when they went in front. That they could not hold onto the advantage was less of a surprise, however, and the first period ended all square at 1-1. Derby soon established control and early warning shots from Tom Lawrence and Chris Baird came to nothing. The first of several defensive mistakes by Laurens De Bock gave home striker David Nugent the chance to add to his tally of goals against Leeds, but he saw his effort well blocked by Cooper. From the resulting corner United somehow survived as the ball flashed almost across their goal-line. Pablo Hernandez did have a volley blocked and Stuart Dallas sent a volley well over after meeting a cross from De Bock. But it was mostly Derby as Nugent headed wide from a Lawrence cross after Berardi had been caught in possession and Tom Huddlestone put his volley into the side netting after keeper Felix Wiedwald could only tip on a dangerous inswinging Lawrence corner. Andreas Weimann was clean through to meet a simple ball over the top of the United back-line, but lifted the ball over as he attempted to lob Wiedwald. Out of the blue it was suddenly 1-0 to Leeds as the home defence fell asleep. De Bock’s excellent crossfield ball found Dallas in space on the right and the Irishman’s cross was headed in by Lasogga with the home defenders strangely static. It was soon back to the previous pattern with Derby doing the pressing and they were unlucky as Lawrence’s 22-yard shot hit the crossbar. In the second minute of injury-time they were gifted an equaliser, however, when De Bock got in Cooper’s way as the centre-half attempted to head a long ball clear. The result was the ball skimming off the captain’s head and Wiemann raced in behind to shoot past Wiedwald to make it 1-1. Derby had the first chance in the second half when Nugent’s header was comfortably saved by Wiedwald following a good run and cross by Lawrence. Heckingbottom made his first change for Leeds with Saiz brought on for the anonymous Roofe in the 55th minute. There was no immediate improvement, though, as Marcus Olsson sent a volley well wide and Nugent shot wide from Wiemann’s pull back after De Bock’s poor pass back had been seized upon. Two minutes later Lawrence had space on the edge of the box and his shot was saved at two attempts by Wiedwald. A second Leeds substitution saw Kalvin Phillips on for the booked Vieira and they forced their first corner after a promising counter attack led by Saiz was only just dealt with. When the corner was not fully cleared Hernandez played the ball back in and Cooper met it only to send his header over. At the other end Lawrence shot wide from the edge of the box, but United were looking more of a threat now and Lasogga hit a snap shot wide from just inside the area. Hernandez limped off soon afterwards with Alioski coming on as the last of the Leeds substitutes. And what an impact he made as he scored within three minutes. Saiz sprung a brilliant counter attack after United had been defending a free-kick on the edge of their own box and squared the ball for the unmarked Alioski in the middle. Although his initial shot was a bit tentative and saved by home keeper Scott Carson he reacted well to head home the rebound. Derby sub Bradley Johnson tried to quickly reply for the hosts, but his long range strike went wide. He then sent a chip wide from the edge of the area and another shot from range off target. There was still time for late drama as Derby came up with an equaliser in the second minute of added time as their substitute, Kasey Palmer, stabbed home a loose ball after the visitors’ defence failed to clear their lines from a corner they should not have conceded. Derby: Carson, Baird, Keogh, Davies, Olsson, Huddlestone, Ledley (Johnson 80), Weimann, Vydra, Lawrence (Palmer 75), Nugent (Jerome 69). Leeds: Wiedwald, Berardi, Jansson, Cooper, De Bock, Forshaw, Vieira (Phillips 63), Dallas, Roofe (Saiz 55), Hernandez (Alioski 76), Lasogga.